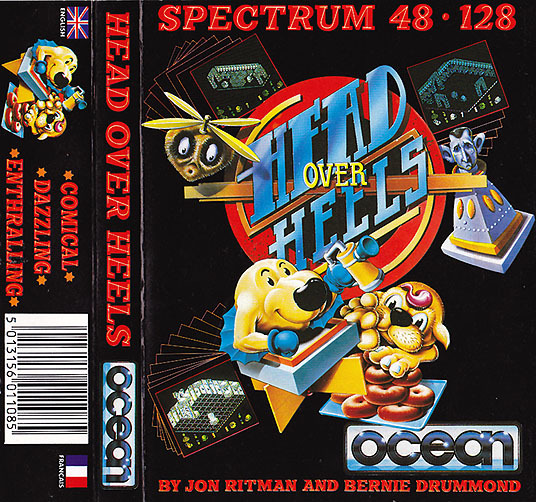 Head over Heels – это игра, ставшая хитом на ZX Spectrum. Она совмещает в себе аксонометрическую псевдотрехмерную графику, головоломку-лабиринт, и просто увлекательную аркаду. Изданная компанией Ocean, которая славится тем, что выпускает только хиты, эта игра вошла в Топ-100 лучших игр всех времен. Не будем особенно останавливаться не предыстории игры, так как она достаточно запутанна и имеет косвенное отношение к происходящему на экране. Стоит лишь отметить, что игроку предстоит управлять по очереди двумя героями, каждый из которых обладает собственными специальными навыками. Кстати, напоминают они кошку и собаку с гипертрофированными конечностями. Цель игры — выбраться из запутанных лабиринтов. Каждая комната имеет свой цвет, и наполнена врагами, головоломками и хитроумными механизмами. Если с врагами все понятно – при соприкосновении с ними наступает смерть, то с головоломками и механизмами все сложнее. 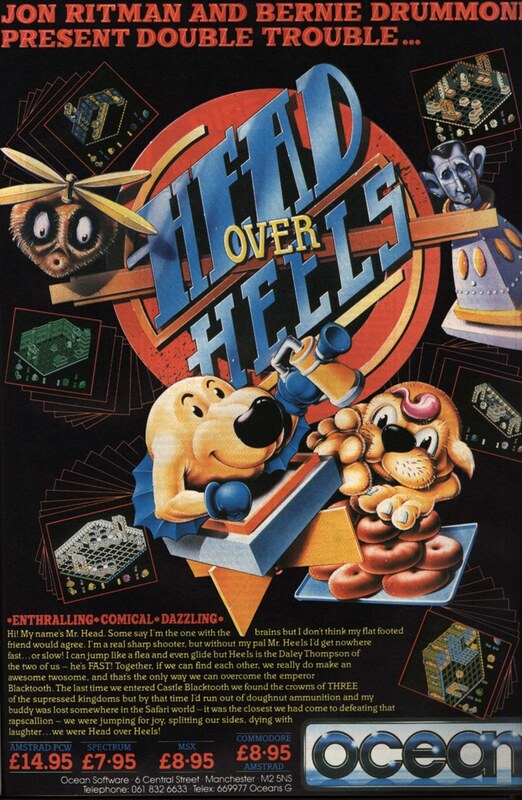 В игре Head over Heels придется напрячь воображение и смекалку, чтобы сообразить, как выбраться из, казалось бы, наглухо запечатанной комнаты. Нужно будет перемещать предметы интерьера или взаимодействовать с устройствами. Тут можно встретить и телепортаторы, и левитаторы, и банальные лестницы, ведущие в другие комнаты. Некоторые стены непроницаемы, в других же можно проделать отверстие, через которое и выбраться из нее. Создается впечатление, что эта игра на «Спектрум» выполнена на том же движке, что и игра Quazatron. Такие же разноцветные комнаты, такое же псевдо-3D. Впрочем, может быть, это был стандартный прием придать играм на этом компьютере необычный вид, привлечь игроков, и в итоге войти в зал славы игр на ZX Spectrum. Taken from the Ocean compilation 'The Magnificent Seven'. it at your peril. (Crash) CRASH SMASH AMS ACTION - MASTERGAME ZZAP SIZZLER. 3. If the computer is a Spectrum 48K or Spectrum + then load as follows. Type LOAD"" (ENTER). (Note there is no space between the two quotes). reset the machine and follow previous loading instructions. Set up the system and switch on as described on your instruction manual. a game selection screen will appear. your chosen game will automatically load. on the Spectrum 48/128 micro computers. may be defined from the keyboard menu. in progress, will offer the chance to resume it. (c) ADJUST THE SOUND. Choice of 3 sound levels. (d) CONTROL SENSITIVITY. Allows a selection of joystick/keyboard response. Step (b) Press ENTER (clears all current keys). go on to Step (d) and then back to (b). (This involves pressing ENTER twice). Spep (d) When all keys are selected press ENTER. otherwise press SHIFT and return to Main Menu. rebellion by finding the crowns lost when Blacktooth took over. indeed these ARE their names and both are highly trained spies. the ultimate accolade, and unfortunately, almost certain suicide. wooden forts in the junge, beware traps! a western library. Only the emperor's minions are permitted to read them. Information is rigotously suppressed in the empire. only way to leave is via teleport to one of the three lunar space stations. and to guide himself though the air. The strangest animal in the known universe! This fish likes to be eaten! turns so poisonous that a single lick can kill. WARNING: Even living reincarnation fish taste horrible! displayed above the doughnut icon at the bottom left of the screen. for Heels to find and get the bag as it is impossible to get far without it. crowns in a bright colour. are two way, some are linked in a chain. Jumping from a spring will give extra height to your jump. opposite direction you have to jump along. entire lives. They are often used as tables and even used as building bricks. thay are sure the coast is clear. (1) Heels. (2) Head & Heels. (3) Head. (4) Head & Heels. At all times the character(s) whose icon is lit is under player control. 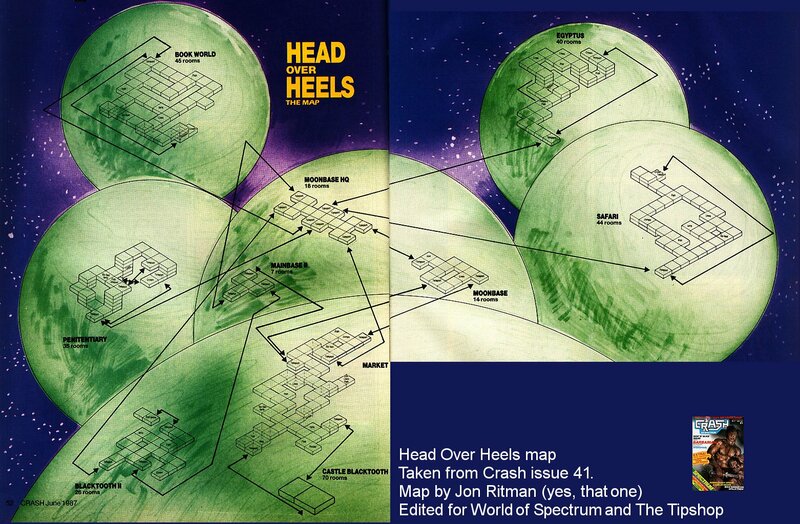 When Head and Heels are joined together all their abilities are combined. It is not possible to swop if standing in a doorway. initially. Only the very skilled can hope to liberate a planet or two. Head on top of Heels and joining them together accurately with the swop key. Both of their icons will light up when they are successfully joined. only be solved by separating Head and Heels. 4. Make sure Head learns to climb ladders, this is an essential skill. for there to be any chance of completing the game. obtained by on jumping off the other's back. 10. Do not waste doughnuts, they are not easy to find. aborted by pressing any key. carefully for any movement in the room as you enter. screen display, keep the pause key depressed. Written by Jon Ritman and Bernie Drummond. Music and sound effect by Guy Stevens. press ENTER key, follow the instructions as they appear on screen. Insert the program disk into the drive with the A side facing upwards. follow the instructions as they appear on screen. on the Amstrad CPC 464, 664 and 6128 micro computers. leads are connected. Press the SHIFT key and the RUN/STOP simultaneously. that all peripherals are removed. 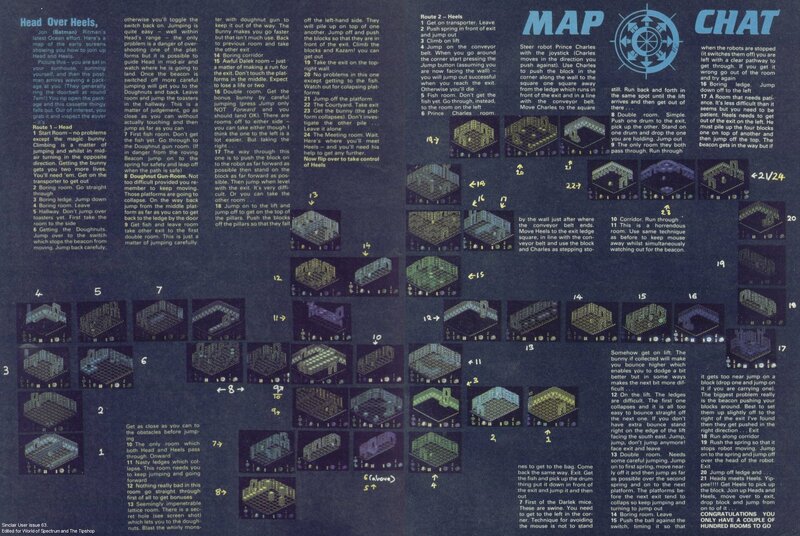 instructions as they appear on screen. on the Commodore 64/128 micro computers. menu by pressing LEFT SHIFT. Step (b) Press COMMODORE KEY (clears all current keys). Spep (d) When all keys are selected press COMMODORE KEY. otherwise press LEFT SHIFT and return to Main Menu. carry together so leave at least one key defined as both. 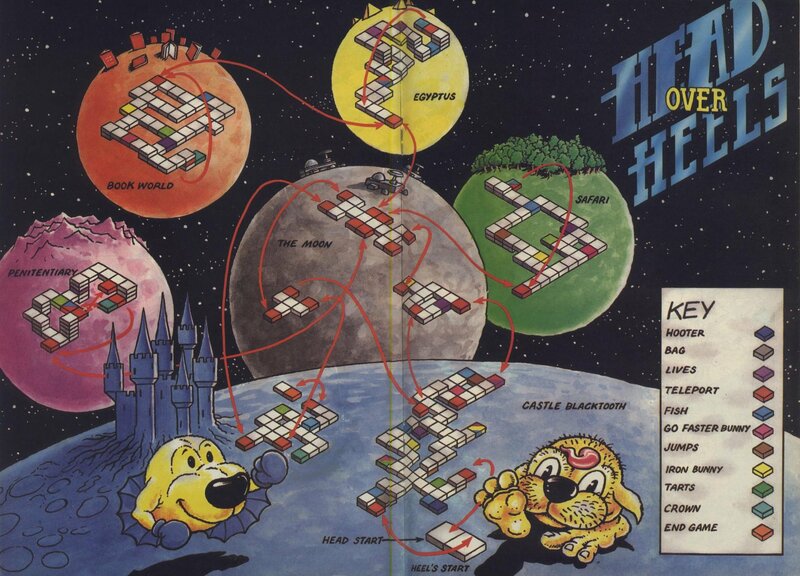 Commodore Coding by Colin Porch. Music by Peter Clarke.